Start Your Search for the Perfect Boot Here! Our advanced boot searching algorithm lets you narrow the field of options by any or all of these filters: gender, test category, brand, boot type, hike modality, last width and even Cantology compatibility! 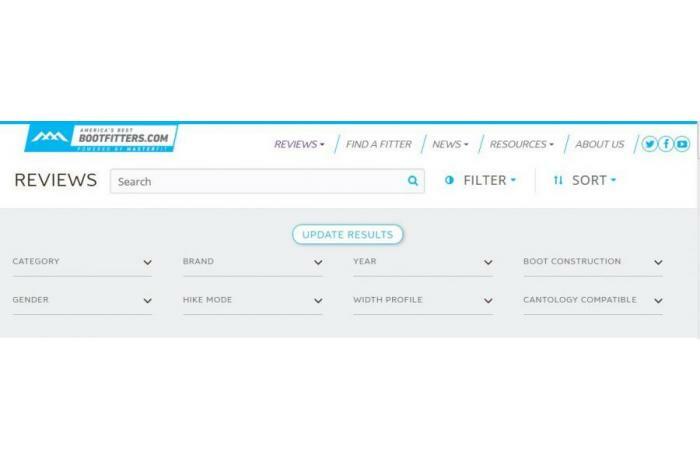 Start your search by selecting Reviews/Boot Reviews from the menu above, then select your FILTER parameters and hit UPDATE RESULTS. Happy hunting, and remember that this is just a start—finalize your search by trying on the boots that make your short list at an America's Best Bootfitters member shop! Read on for our tips on how to find your best match…. 1) Don’t buy a boot without trying it on, period. This means you’ll need to work with a brick-and-mortar retailer, and preferably one that does a good job with bootfitting and understands your goals (i.e. an ABB shop--find one here). A couple notes of bummer reality: If you are a man who wears a size 24.5 or smaller, you will probably not find men’s boots in your size for try on. You will need to try on women’s boots to get close enough to pull the trigger on a special order. If you are a woman who wants to ski unisex (men’s) boots size 24.5 or smaller, you’re in the same boat. 2) Confirm your size with an ABB bootfitters help—some models run long, some run short. Depending on your goals you may be changing size since your last pair. 3) Determine your “last width,” or in other words figure out whether you’re a narrow, medium or wide. (check out our guide to last width) Don’t bother measuring your foot with a digital caliper—go try some on. You’ll know what sort of “width neighborhood” you'll want to hang out in pretty quick. If your past boots have always “packed-out” try going narrower. If your past boots have always left you numb and cold, consider going wider. 4) Try on a few pair in the appropriate stiffness (see our guide to Flex Index), and allow your bootfitter to guide you in selecting models even if you already have a short-list of boots in mind. If you have pretty similar feet, left to right, then try a different model on each foot to speed the selection process. When you narrow down your selection, be sure to wear those as pairs to rule out foot differences. 5) Pull the trigger when you find what you’re looking for! What are you looking for? It can be different for everybody, but generally you want the boot that’s both the most snug and the most comfortable at the same time, without numbness and with an awesomely even fit along the shin and all the way down to the instep where the leg meets the foot. Why is the shin to instep zone so critical? Because it’s hard to fix a problem there, while your other problematic bony bits or volume issues are generally workable with the help of a skilled bootfitter. 6) How do I know they’ll ski well? Shouldn’t I test the boots on snow the way I might a ski? No, for a few reasons. First, your options for boot testing or “demo” are limited, and if you let that one criterion drive your selection process you’ll miss out on a lot of good boots. Second, the vast majority of boots today have good, neutral stances and ski well. Third, your ABB member shop won’t be carrying boots that ski poorly if they’ve done a good job with their boot buy. If you’re still skeptical, take a look at our boot reviews which are based on actual testing by multiple testers per model—at this point in time there’s really only one source for that, and you're there. 7) What about footbeds, cuff adjustment, canting? How about heel lifts? These are all potentially good things, but certainly not everybody needs all of that. Working with a good bootfitter is the key to answering all those questions. If It's All About Fit, Why Have an On-Snow Test?